Intel DP67BA - this motherboard with the type of connector processor Socket 1155. Supports processors of the second generation of the Intel Core i7, i5, i3 and Pentium. Also support processors with a TDP of up to 95 Watts. Intel P67 system bus Direct Media Interface (DMI 2.0 2.0) 5 GT/sec. Memory 4 x 240-pin 1.5V DDR3 DIMM SDRAM maximum memory: 32 Gb. Audio 8-channel based on the Realtek ALC888. Network 10/100/1000 Mbits/sec on the basis of Intel 8259V. 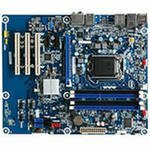 Excellent motherboard which is suitable for both office and gaming computer.